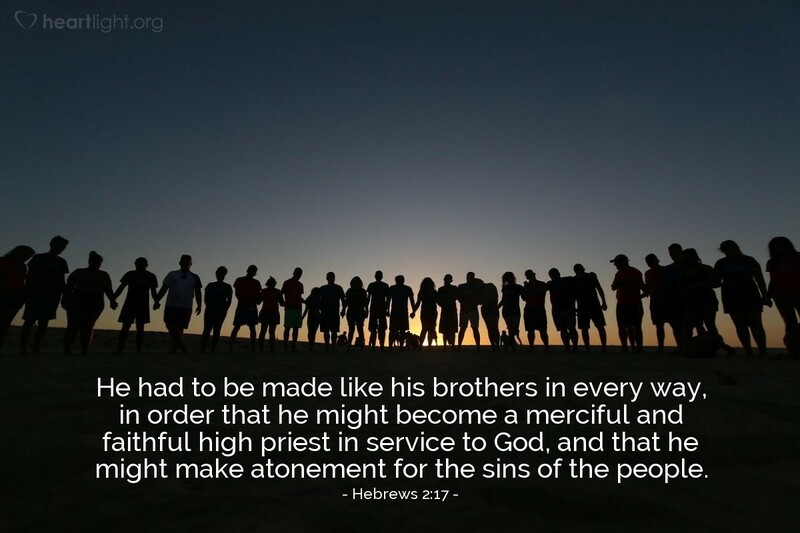 He had to be made like his brothers in every way, in order that he might become a merciful and faithful high priest in service to God, and that he might make atonement for the sins of the people. There are not many things the Bible says Jesus "had" to do. This is a key one. Jesus had to be one of us. Notice that he did this so he could be like us, his brothers (and sisters) in every way. The reason? So he could be the perfect and faithful high priest who not only made atonement for our sins, but was also the atoning sacrifice for those sins. Incredible! Thank you, Lord Jesus, for the incredible sacrifice you made so I could be adopted into our Father's family and become your younger sibling in our eternal family. Thank you for this grace that was motivated out of your love and carried out by your loving faithfulness. Through your name, Lord Jesus, I offer my praise and thanks to our Father. Amen.